Dover-Calais: P&O delays approx. 45mins. DFDS delays 1h30 (also to Dunkirk). MyFerryLink currently 120mins. Eurotunnel passenger France 30mins earlier cancellation. Condor Ferries cancels fast ferry services UK-Channel Islands. Brittany Ferries cancels Plymouth-Roscoff today, and Portsmouth-Santander today and Saturday. Cherbourg-Poole delayed until 20:30. Portsmouth-Bilbao-Portsmouth Sunday and Tuesday sailings brought forward to Saturday and Sunday. LDLines Newhaven-Dieppe cancelled today and tomorrow. St Nazaire-Gijon postponed until tomorrow. Poole-Santander delayed tomorrow, cancelled on Sunday and Poole-Gijon cancelled Tuesday. WEATHER ALERT: Amber alert flooding France, high winds and storms Germany, coastal event Spain/Portugal, fog Montenegro. WEATHER: Severe gales and rain in the North West. Heavy snow North and East. ROADS: Snow on high ground. Some minor roads still closed south Switzerland. Next busy day on Saturday. TRAFFIC: No delays greater than 10mins. Earlier queues Germany A81 southbound J13-14 and J27-28 now gone. Austria>Germany: earlier back roads queues towards Kufstein/A12 border crossing now gone. 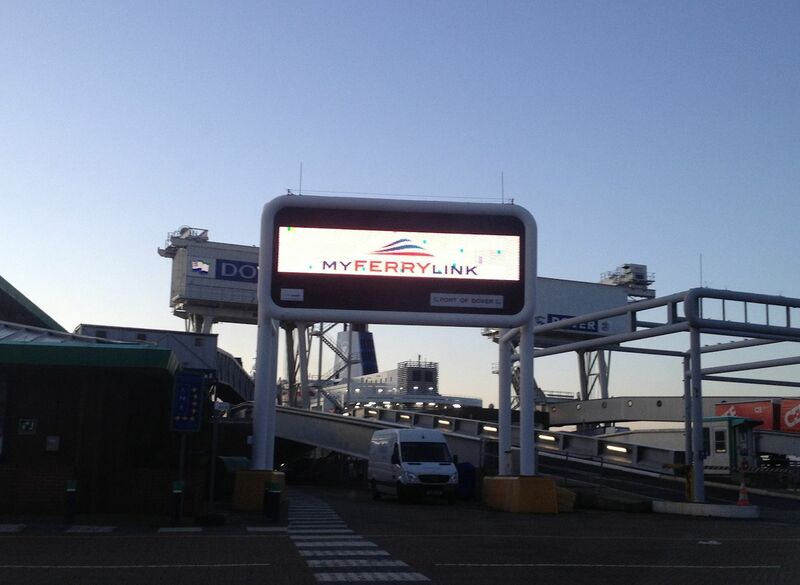 The future of Dover-Calais ferry operator MyFerryLink is still in doubt. The Competition Commission still has time to consider the Eurotunnel/MyFerryLink case. On 4 December last year the Competition Appeal Tribunal found the Competition Commission did not have jurisdiction to investigate the supposed merger between the two firms. The Competition Commission had a month to examine the verdict and decide whether to reopen the case. Early January is normally a quiet time cross Channel. This case at least ensures the New Year will start off with a bang. For the background and a live blog of the events of 4 December click here. FRANCE. 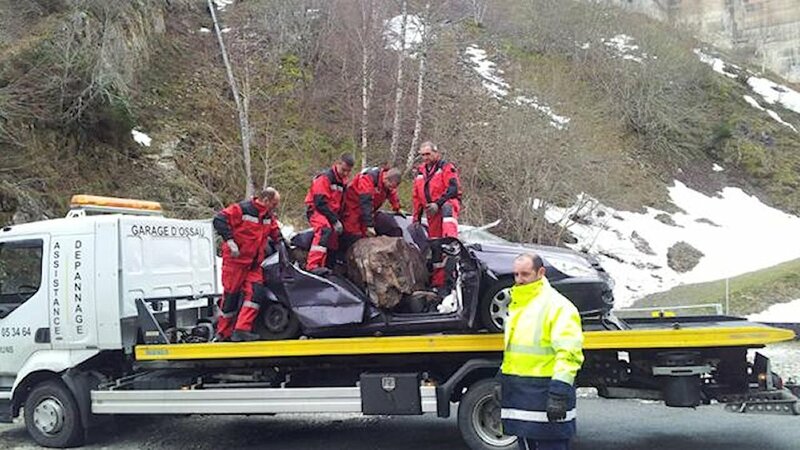 A pregnant woman was killed today after a 400kg rock crashed through the roof of her car in the Pyrenees. Her husband sat alongside escaped unharmed. The couple were driving on the D934 near Artouste south west of Lourdes. Restrictions are currently in place between Laruns and Gabas for investigations though the stretch to the Spanish border is open. Pic via @F3Aquitaine. POLAND. Draconian measures to tackle drink driving are expected after six people died after being hit by a drunk driver on New Year’s Day. One other person is in a critical condition after the incident at Kamien Pomorski in the north west of the country. It comes a week after another high profile drink driving case when a car crashed into the entrance of a subway in Warsaw. Poland is regularly cited as having the worst road safety record in the EU though significant gains have been made in recent years. Drink driving however is said to be ‘socially acceptable’. The package of measures is due to be announced after a Cabinet meeting next Tuesday. 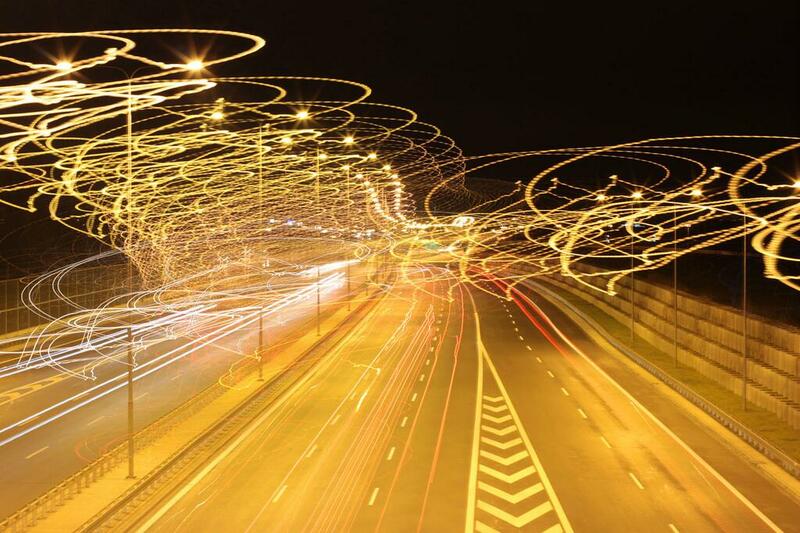 Photo via @GDDKiA Polish Roads Directorate. ← Ireland and Luxembourg: blips, anomalies or harbingers?